Welcome to today's edition of Nerd Alert, where we have all the off-beat, nerdy news for you in one convenient spot. What do we have in store for you on this manic Monday? Conan reveals their Batman v Superman: Dawn of Justice trailer parody, watch how Jurassic World should have ended and Archer pokes fun at Comic-Con. Plus, one SDCC cosplayer's costume was too big for the San Diego Convention Center elevator and much more. So, sit back, relax, and check out all that today's Nerd Alert has to offer. 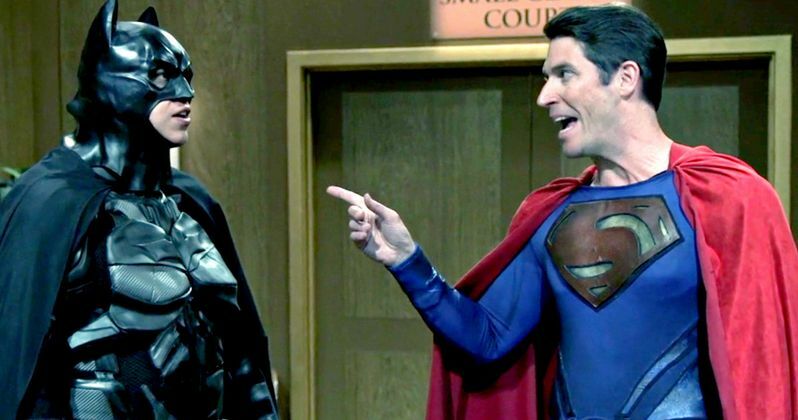 TBS' Conan aired live from Comic-Con all week, and the show was peppered with parodies of highly-anticipated movies and TV shows, one of which was the show's version of the Batman v Superman: Dawn of Justice. Like the highly-anticipated superhero movie, this trailer does feature Batman and Superman squaring off, but they do so in small claims court. Joopadoops has put together an awesome piece of artwork that depicts some of The Muppets in Mad Max: Fury Road. Animal has taken over as Max, with his fellow members of the Muppet band Electric Mayhem, Janice, Floyd Pepper and Zoot also getting in on the fun, with Floyd Pepper taking over as the flamethrowing guitarist. Vimeo user Sandra Amaranto has put together a fun little video that gives us a Marvel superhero for every letter of the alphabet. It's very inventive although I'll admit to not knowing what a few of these are, specifically, K, Q and Z, but any Marvel fan will surely get a kick out of it. How It Should Have Ended has decided to tackle the mega-blockbuster Jurassic World in their latest animated parody, where they take the movie to task for having a "dinosaur-sized gate" that the Indominous Rex can escape through, the gyroscope scene, and the controversial "running in high heels" scene. Obviously, the movie is doing just fine on its own, but this video hilariously skewers some of the head-scratching plot points. FX's hit animated series Archer has been a fixture at SDCC for several years, with the voice cast members all participating in a panel. This year, the show presented a hilarious video to their panel, where Sterling Archer (H. Jon Benjamin) reveals that he's relieved that he isn't going to SDCC, while Pam (Amber Nash) shows off her impressive Immortan Joe costume from Mad Max: Fury Road, which Archer hilariously misidentifies. Archer also skewers Batman v Superman: Dawn of Justice, The Man from U.N.C.L.E. and even Judy Greer, who voices Cheryl on the show. Unfortunately, the video cannont be embedded, so visit Entertainment Weekly to check it out. Every year at SDCC, thousands of fans dress up as their favorite movie and TV characters, but one cosplayer's costume caused her to have a bit of trouble in getting around the San Diego Convention Center. The Hollywood Reporter posted a video of Erin Vedar, whose fantastic Vanelope Von Schweetz costume from Wreck-It Ralph was so big that she couldn't even fit in the elevators, forcing her to take the escalator, with a security guard holding up the back of her costume. Her costume did allow for one big perk, though, she got to meet Alan Tudyk, who voiced King Candy in the animated classic. "This morning, I met King Candy! The voice of King Candy went up to me and is like, [in a booming voice] 'I'm King Candy!' It was the moment of my whole life." During a NerdHQ Q&A session for the upcoming animated show SuperMansion, Bryan Cranston was asked by a Breaking Bad fan, who is originally from Albuquerque, where the show was shot and set in, if there's anything in particular he enjoyed about working in ABQ. The actor dropped possibly the best "your mother" joke in history, deserving of a literal "mic drop." Sure, it was kind of mean, but I surely didn't expect that response, and neither did the crowd. The geniuses at College Humor have put together a brilliant video that pokes fun at people who always insist that the book is better than the movie, by putting these characters in a movie, based off a book about books being better than movies. Confused? You should be, but it's hilarious nonetheless.